Tim O'Dell Music - Liner Notes, Etc. Contrary to its humble profile by the standards of more mass public consumables, the culture of jazz big band music is alive, well and evolving into a fascinating future present. One strong contender and champion in the contemporary big band field is composer-saxophonist Tim O’Dell, whose new collection of music beautifully supports the notion that big band music can be at once rooted in a grand venerable tradition while pushing forward and laterally into new ideas and sub-genre directions. 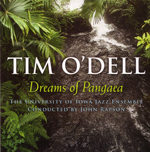 On Dreams of Pangaea, his latest of several projects for the Southport label, O’Dell presents his big band persona in expansive and impressionistic ways. Providing the impressive performance honors is the ensemble known as Johnson County Landmark, a band consisting of students and faculty based at the University of Iowa and directed by trombonist-bandleader-professor John Rapson. Rapson himself is a musician, like O’Dell, with a personal commitment to big band thinking outside the old school box (yet also intent on paying respects to various “old schools”). This project involved a homecoming of sorts. O’Dell earned his Bachelor’s and Doctoral degrees at the University of Iowa, and his Master’s in Jazz at the New England Conservatory. Oregon-born, Chicago-raised and now Maine-based, O’Dell boasts an impressive and mature voice as a composer and arranger, whose artistic language is worldly rather than region-specific. The range of stylistic references and artistic connections touched on here spans American and European modes of musical thought. His writing can be reminiscent of Gil Evans, Maria Schneider, and of state-sponsored big bands across the Atlantic, but with plenty of O’Dell’s own signature touches along the way. Opening the album gently and hypnotically, “Mirage” embodies its title with a sinuous bass ostinato on bass clarinet and then acoustic bass, with elliptical swatches of horn writing and the quixotic trumpet soloing of Brent Sandy calling to mind the old Miles Davis/Gil Evans rapport, revisited. “Adverse Side Effects” pits its myriad variations and detours atop a deceptively simple two-chord pattern, with fine solos by Bob Thompson on soprano sax, and drummer Rob Baner. Latin pulses ruggedly pulse in the driving title track, “Dreams of Pangaea,” in the middle of which the free-leaning solo passages suggest Sun Ra’s aesthetics more than any standard brand big band model. O’Dell can align his compositional thinking to large ideas and structures, as with the interlocking, introspective “Retrospection,” with trumpet sonorities from Brian Smith playing a key role through the probing, sometimes melancholic maze of harmonic motion. With this body of music, O’Dell’s music paints pictures and evokes moods, while also deftly and persuasively expanding the vocabulary for the medium. Tim O'Dell's set of duets with bassist Tatsu Aoki, assisted by bass trumpeter Ryan Shultz on the "Ancient Pines Suite," is about spontaneous creativity, the contrast between space and sound, and purposeful improvising. If all of that sounds a bit dry, the music proves to be anything but. The interaction between O'Dell and Aoki is full of color and excitement, melodies and rhythms are part of the music rather than being discarded as too old hat, and there is enough intensity in the playing to set the "ancient pines" on fire. Tim O'Dell, whose alto and soprano playing at times recall the relaxed but explorative improvising of Lee Konitz and Steve Lacy while sounding quite individual, was born in Oregon. "My Dad used to play a lot of Copland, Beethoven, big band and Herb Alpert records. I dedicate this album to Dad's musical support because he and my mother always supported my decision to play music, and they even encouraged me to practice." O'Dell first began on the alto sax, adding the soprano in high school. "I switched to tenor for awhile in middle school. In high school I went to a music camp at the University of Iowa and had the opportunity to be around other serious young musicians who were into jazz. That's when I realized that that's what I wanted to do with my life. In college when I was working towards my saxophone performance degree, I found that it was better for me to be on alto. I worked on the alto so hard for all of those concertos, sonatas and etudes that I became an alto player." O'Dell has earned a Doctor of Musical Arts degree in Saxophone from the University of Iowa and a Master of Music degree in Jazz Studies from the New England Conservatory. During 1993-2001 he was the Director of Jazz Studies and Professor of Saxophone at Augustana College in Rock Island, Illinois. Living just west of Chicago gave him an opportunity to play with other musicians in the Chicago jazz scene and through the years he has performed with Danilo Perez, Tim Hagans, George Garzone, Louis Bellson, Gunther Schuller, Willie Pickens, Muhal Richard Abrams and George Russell among many others. Among Tim O'Dell's earlier recordings are Windy Christmas for the Chicago IEL label, Elijah Levi's Southport CD Finally Elijah, the Red Fire Ant Trio's Live In Iowa City for Toe Records and his Southport debut as a leader Before My Life. The latter features O'Dell heading a sextet that includes bassist Tatsu Aoki, bass trumpeter Ryan Schultz, guitarist Steve Grismore and both David Pavkovic and Jim Dreier on drums. In 2001 Tim O'Dell moved to Maine where he is Saxophone/Jazz Studies instructor at the University of Southern Maine. "I think it's very important for students to develop their own voice in their sound and the way that they approach chord changes and create. The main purpose of playing jazz is to create one's individuality and that is the general lesson that I try most to get across to students." So much for history. How did Ancient Pines come about and what inspired Tim O'Dell to strip his group down to a duo/trio? "Tatsu Aoki and I have played together since 1993, including in the Red Fire Ant Trio with drummer David Pavkovic, and he's a mentor to me in many ways. I always admired his looseness, creativity and fearlessness, coupled with his amazing time and his love for the role of the bass. He plays the bass like a bass, not like a horn. He also takes his time in the music like Lester Young. We had played a duet on my Before My Life CD that worked very well and I thought that this would be an interesting project. I'm really pleased with how it came out and how comfortable it felt." Tatsu Aoki, long a familiar name in the Southport catalog, has appeared on over 70 albums as a sideman not counting the 30 that he has led in a wide variety of settings, from solo bass performances to big bands and all types of challenging groups. In addition, he is the founder and artistic director of the Chicago Asian American Jazz Festival, the president of Asian Improv Records and has produced many recordings. Two intriguing facts about the Ancient Pines project are surprising: Much of the music, though sounding composed, was spontaneously improvised, and the entire set was recorded in one day, coming together very fast. The program starts off with "Textual." O'Dell's unaccompanied alto plays the theme before Aoki's bowed bass echoes his thoughts. Their interplay, even as they wander away from the melody, stays telepathic and retains the mood of the piece through the final long note. "The Drive" starts with some swinging solo alto, which by the third minute is accompanied by a percussive one-note pattern from Tatsu. O'Dell is musically naked throughout, thinking aloud and building his ideas from fresh new melodies. There is nowhere (and no need) from him to hide. This thoughtful piece is followed by the 26 seconds of "Toddler." The latter romp is kept purposefully very short and manic so as to demonstrate a young child's very brief attention span, spending 20 seconds on one activity before suddenly deciding to do something else. "Anticipation," like "The Drive," is a free improvisation that sounds so logical that one would guess that it was composed beforehand. O'Dell's lyrical ideas and Aoki's willingness to build on the saxophonist's thoughts make this a very unified and logical performance, one in which the music is far from being merely random sounds. O'Dell plays with the passion of an Eric Dolphy during the latter part of this piece. He switches to soprano for the haunting "Rise & Fall" which is very much a conversation with the bassist and would probably work equally as well if played by a much larger ensemble. Ryan Shultz's bass trumpet is added to the group for the three-part "Ancient Pines Suite." "I've known Ryan for four or five years. He is Mr. Versatile, someone who can swing hard, sightread, is very sensitive and can improvise in any context. He has a unique voice, even beyond the fact that he's playing the bass trumpet." Inspired by a pair of huge and ancient trees that are in O'Dell's backyard in Maine, the "Ancient Pines Suite" begins with "Fanfare/Squirrels" which has a hot free bop solo for bass trumpet and some exciting interaction with the soprano over Aoki's walking bass. "Old Growth" is a brooding ballad that displays Aoki's giant tone on the bass with occasional menacing long tones from the horns. The final section, "Majestic Perspectives," has the two horns playing independent of each other before joining in on a theme and some improvised counterpoint over Aoki's powerful bass, bringing the suite to a logical conclusion. "Come Here" is a free improvisation that spontaneously developed a plot. It is as if the bass is telling the soprano sax to "come here" (like a mother calling her son home for supper). O'Dell purposely circles Aoki without hooking up with him, resisting his call until finally deciding to join together at the end. "Opinions" was originally a trombone duet. O'Dell plays the upper part at first while discarding the bass trombone section and instead having Tatsu improvise a difficult and repetitive pattern. The soprano-saxophonist was clearly quite inspired playing over the pattern which gives him infinite freedom to express himself. "You Can't Find Me," a free improvisation inspired by the thought of the saxophonist playing "hide and seek" with his children, manages to be both dramatic and playful at the same time. "Aphelion" has the duo expanding as Tatsu is heard on two overdubbed basses while O'Dell's written alto part is joined by his improvised ideas on soprano, creating a desperately lonely mood. In contrast, "Sneaky" is a swinging soprano-bass duet that wraps up the stimulating set with exhilarating joy. Tim O'Dell is enthusiastic about the future. "I have at least six CDs in line that I want to record. I plan to keep on writing and playing for several core ensembles. By continually putting out quality records with different people, trying to break new ground, things will start to increase in visibility. My goal is to get out all of the music that I hear inside myself." Considering the high quality of the music on Ancient Pines, one looks forward with great anticipation to Tim O'Dell's future projects. The melody of "Textual" is taken from a quintet that I am composing to be fitted with a work of visual art. The expansive, harmonically loaded melody presented here in duo format allows Tatsu and I plenty of room to converse. "The Drive" sounds and feels like the promising April drive that I made from my new home on the East Coast to Chicago to record this project. "Toddler" is inspired by toddlers everywhere and specifically by toddler Kai MacAyeal with whose family I stayed the night before we recorded this. "Anticipation" was inspired by my beautiful wife Sue. Tatsu’s open, grooving style of playing provides all the glorious freedom one could ask for. The melody of "Rise and Fall" was written with Tatsu’s openness in mind. The "Ancient Pines Suite" was inspired by the two enormous conifers in our Maine backyard, which I frequently look out upon while composing. The suite was conceived as the centerpiece of this album and features Tatsu and Ryan in different settings. Multiple pitch/harmonic and rhythmic relationships connect the three movements while I have attempted to leave plenty of room for solo and collective improvisation. "Opinions" was adapted from a trombone duet that I was commissioned to write while attending the New England Conservatory. Tatsu’s stubborn, improvised bass part replaces the original bass trombone lines and while totally changing the work, allows me nearly infinite harmonic freedom as an improviser. "You Can’t Find Me" captures all the drama and intrigue of a game of hide and seek between my sons Travis, age 14, and Ben, age 3. "Aphelion" is an astronomical term that is roughly defined as the farthest orbit that a smaller body can have around a larger body before drifting away. This is occasionally how I feel as a jazz artist orbiting around the larger jazz canon and this piece attempts to represent that loneliness. Originally entitled "NOVEM," a nine-tone work for string quartet (which was premiered at the Oberlin Conservatory in 1991), "Sneaky" utilizes NOVEM’s active second movement as a springboard into free bop antics. This album is dedicated to my late father, Louis Robles (1927-2003), who along with my mother was my initial musical inspiration and most profound supporter through the years. Thanks for the music, Dad. Very Special Thanks To: my wife Sue, mother Judy, and sister Cynthia for their unwavering support of me; Tatsu for ten years of mentoring me and for his work on this project; Sparrow and Joanie for their artistic freedom and all the other wonderful elements that Southport brings to the table; and Ryan Shultz for his superb musicianship, quick ear, and sensitivity. Tim O’Dell envisions homelands, sees their landscapes, pours them into sound, presses them into tiny-pitted aluminum discs that enter your home, play you the pictures, take you away. Where? To scenes as amorphic as the distant future (“We Will Be There”), and as specific as the sturdy fingertips of the music’s bassist (“Mr. Aoki”). To the Homer Winslow sobriety of a becalmed sea (“Ship’s Wake”) and the synaptic hilarity of the human sub consciousness (“Id”). From the bustling symmetry of “Fire Ants” to the seraphic solo saxophony of “Angel And The Boys,” Heaven and Earth and much of what lies between. Homelands and landscapes – outposts of the imagination. But who’d have believed the prairie – the prairie! – could yield so many of them, so many different outposts? Tim O’Dell, and all the musicians who play Before My Life, come from the prairie, and despite the breadth and depth of the landscapes seen here, all the music they play could have come from no place else. Rock Island, Illinois, on the Iowa border, where Tim O’Dell and Steve Grismore live and teach at Augustana College; Chicago – home of the others – Chicago to Rock Island, it’s only 155 miles, three hours but only if you drive too slow and run into traffic. Not so bad, really – three hours on the prairie. Not even so bad to spend an entire adult life on the prairie, stretching from the carbuncled shores of Lake Michigan across the flatland contours beneath the man-made mountains and canyons, under the hi-rise hills and bungalowed bumps that form the city’s margins, past the airport out by exurbs and pastures, farmland featureless to the untrained eye, all the way to I-O-Way. A new sound has emerged from late 20th-century Chicago, from the ghosts of blues bars and jive joints, reaching out to the edgy tendrils of avant-gardes from Satchmo to Lennie T to Muhal to Kenny V*, rough but not always jagged, jumpy but focused, concrete abstractions of landscapes and homelands. The prairie leaves its mark. This openness, this unbounded stretch, this beckoning expanse of space that mystified and enthralled the first outsiders to see it – the prairie itself provides the perspective. Miles Davis and John Lewis, who both birthed the cool, were born in Illinois; Bix Beiderbecke, who conceived the notion in the first place with his clean uncluttered lines that point at far-off vanishing points, was born in Iowa. Lee Konitz grew up in Chicago, pushed Lennie’s ideas toward Braxton but also toward Tim O’Dell, who like Braxton has left his mark as a composer and a classicist and the leader of ensembles on the border between the African-American and the Euro-centric. Braxton gave them to the Chicago trombonists he hired for his band, George Lewis and Ray Anderson, and aren’t we getting close to Ryan Shultz in this family tree? At the other end of the isolated straightaway, in almost Iowa, Tim O’Dell finds his common ground with these musicians and hammers together his ten-sided exhibition, irresistible portraits of ten times as many emotions, with plenty of room for them all to breathe. The prairie leaves its mark. Special Thanks to Dan Urton, Rita Gustafson, and Mary Lorenson in the Augustana Cultural Events Office, and to Music Dept. Chairman, Dr. Mike Green, for their invaluable support.